Mosasaur is any of the various extinct, marine reptiles comprising the family Mosasauridae, which were the dominant predators of the Earth's oceans during the last 25 million years of the Cretaceous period. These reptiles were typically characterized by a long, slender, serpentine body, long tails, a conically shaped head, and limbs that served as paddles, with many characterized by very large size (Everhart 2008). Two species, one a Hainosaurus and one a Mosasaurus, reached nearly 17 meters (56 feet) in length. Smaller species also occupied other ecological niches (Everhart 2008). Fossils have been found on every continent, including Antarctica, indicating a wide distribution in the oceans. Although dominant for a very long time, Mosasaurs disappeared around the time when the dinosaurs disappeared, at the end of the Cretaceous. However, they played an important role in the food chains of their time, and helped prepare the environment for life today. Their discovery was likewise noteworthy, with the first publicized discovery of a fossil in the Netherlands in 1780 preceding dinosaur fossil discoveries, drawing the attention of the world to the existence of fossilized animals, and the need to reconcile such findings with existing scientific and religious paradigms. Mosasaurs were reptiles that had a body shape similar to that of modern-day monitor lizards (varanids), but were more elongated and streamlined for swimming. Their long slender body shape has also been compared to that of a snake (Everhart 2008). The mosasaur limb bones were reduced in length and their paddles were formed by webbing between their elongated digit-bones. The head region was conical in shape and very narrow and long in some species (Everhart 2008). Their tails were flattened laterally and supplied the locomotive power for swimming (Everhart 2008). All reptiles breathe air using lungs. The noticeably expanded chest region of mosasaurs suggests they may have retained two lungs, unlike snakes (Everhart 2008). Mosasaur skull Oxford University Museum of Natural History. Mosasaurs had a double-hinged jaw and flexible skull (much like that of a snake), which enabled them to gulp down their prey almost whole, a snakelike habit that has helped identify the unmasticated gut contents fossilized within mosasaur skeletons. A skeleton of Tylosaurus proriger from South Dakota included remains of the diving seabird Hesperornis, a marine bony fish, a possible shark and another, smaller mosasaur (Clidastes). Some showed remains of a turtle and a plesiosaur (Everhart 2005a). Mosasaur bones have also been found with shark teeth embedded in them. Mosasaurs were powerful swimmers, although their body shape suggests they were inefficient for high-speed swimming compared to the rapidly swimming ichthyosaurs and plesiosurs, other marine reptiles whose age of dominance preceded that of mosasaurs. The method of locomotion of mosasaurs may have been similar to that used by the conger eel or sea snakes today. The animal may have lurked and pounced rapidly and powerfully on passing prey, rather than hunting for it (Everhart 2005a). Mosasaurs were well-adapted to living in the warm, shallow epicontinental seas prevalent during the Late Cretaceous period. Mosasaurs were so well adapted to this environment that some fossils show evidence that they gave birth to live young, rather than return to the shore to lay eggs, as sea turtles do (Everhart 2005a). For example, a fossil of Plioplatecarpus had the remains of several unborn in her abdomen (Everhart 2005a). The smallest-known mosasaur was Carinodens belgicus, which was about 3.0 to 3.5 meters long and probably lived in shallow waters near shore, cracking mollusks and sea urchins with its bulbous teeth. Larger mosasaurs were more typical: mosasaurs ranged in size up to 17 meters. Hainosaurus holds the record for longest mosasaur, at 17.5 meters. The name Mosasaur comes from the Latin Mosa meaning the "Meuse River" in the Netherlands, and Greek sauros meaning "lizard." The Meuse River was the locality were the first mosasaur was found (Everhart 2005a). Sea levels were high during the Cretaceous, which is expected to correlate with marine transgressions in many parts of the world and caused a great inland seaway in what is now North America. Mosasaur fossils have been found in the Netherlands, in Sweden, in Africa, in Australia, in New Zealand and on Vega Island, off the coast of Antarctica. In Canada and the United States, complete or partial specimens have been found in Alabama, Mississippi, Tennessee, and Georgia and in almost all the states covered by the seaway: Texas, southwest Arkansas, New Mexico, Kansas (Everhart 2005b), Colorado, Nebraska, the Dakotas, Montana, and the Pierre Shale and Fox Hills formations of North Dakota (Getman 1994). Mosasaurs are also known from Mexico, Peru, Denmark, and California. Many of the "dinosaur" remains found on New Zealand—a volcanic island arc that has never been part of a continent—are actually mosasaurs and plesiosaurs, another group of Mesozoic predatory marine reptiles. 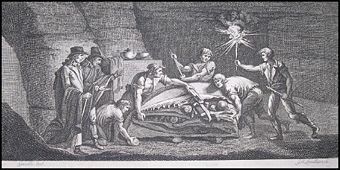 The first publicized discovery of a fossil mosasaur preceded any dinosaur fossil discoveries and drew the Age of Enlightenment's attention to the existence of fossilized animals. The specimen was discovered in 1780 by quarry-workers in a subterranean gallery of a limestone quarry in the vicinity of Maastricht in the Netherlands. Maastricht is situated on both sides of the Meuse River. The quarry workers quickly alerted Doctor C. K. Hoffman, a surgeon and fossil-hunter in the Dutch city of Maastricht, although rights of ownership lay with a canon of Maastricht cathedral, as owner of the overlying land. Dr. Hoffman's correspondence among men of science made the find famous. When the Revolutionary forces occupied Maastricht, the carefully-hidden fossil was uncovered, betrayed, it is said, by a case of wine, and transported to Paris, where Georges Cuvier was able to describe it for science, although le grand animal fossile de Maastricht was not actually described as a Mosasaur ("Meuse reptile") until 1822 and not given its official name, Mosasaurus hoffmanni, until 1829. Several sets of mosasaur remains, that had been discovered earlier at Maastricht but were not identified as mosasaurs until the nineteenth century, have been on display in the Teylers Museum, Haarlem, since about 1770. Mosasaurs are considered to have evolved from semi-aquatic squamates known as the aigialosaurs, close relatives of modern-day monitor lizards, in the Early Cretaceous period (Everhart 2005a). Research reported in Netherlands Journal of Geosciences also supports the view that the recently uncovered Dallasaurus turneri is an early link between land-based monitor lizards (such as the Komodo dragon) and the aquatic mosasaurs. Dallasaurus turneri is considered a mosasaur but had complete land-capable limbs, feet and hands unlike later mosasaurs, which had flippers. Based on features such as the double row of pterygoid ("flanged") teeth on the palate, the double-hinged jaw, modified/reduced limbs and probable methods of locomotion, many researchers believe that snakes and mosasaurs have had a common ancestor. This theory was first suggested in 1869, by Edward Drinker Cope, who coined the term "Pythonomorpha" to include them. The idea lay dormant for more than a century, before being revived in the 1990s (Everhart 2005a; Palaeos 2006). There is support for the view that these ferocious marine predators are close relatives of snakes based on cladistic analysis of symptomatic similarities in jaw and skull anatomies (Lee 1997). During the last 20 million years of the Cretaceous (Turonian-Maastrichtian), with the extinction of the ichthyosaurs and pliosaurs, mosasaurs became the dominant marine predators. The ichthyosaurs declined greatly in the early Cretaceous for unknown reasons and are thought to have been extinct by the time of the earliest mosasaurs (Everhart 2005a). Everhart, M. J. 2005a. Mosasaurs: Last of the great marine reptiles Oceans of Kansas. Originally published as Everhart, M. J. 2000. Mosasaurs: Last of the great marine reptiles. Prehistoric Times. 44:29-31. Retrieved May 25, 2008. Everhart, M.J. 2005b. Enter the Mosasaurs. Chapter 9 in M. J. Everhart, Oceans of Kansas: A Natural History of the Western Interior Sea. Bloomington, IN: Indiana University Press. ISBN 0253345472. Everhart, M. J. 2008. Rapid evolution, diversification, and distribution of mosasaurs (Reptilia; Squamata) prior to the K-T Boundary Tate 2005 11th Annual Symposium in Paleontology and Geology. Casper, WY, p. 16-27. Retrieved May 25, 2008. Getman, M. R. C. 1994. Occurrences of Mosasaur and other reptilian fossil remains from the Fox Hills Formation (Maastrichtian: late Cretaceous) of North Dakota. St. Lawrence University Press. Lee, M. S. Y. 1997. The phylogeny of varanoid lizards and the affinities of snakes Philosophical Transactions of the Royal Society London 352: 53-91. Retrieved May 25, 2008. Palaeos. 2006. Pythonomorpha Palaeos. Retrieved May 25, 2008. Southern Methodist University (SMU). 2005. and Dallas Museum of Natural History announce missing fossil link: Dallasaurus SMU News Release November 16, 2005. Retrieved May 25, 2008. Mosasaurus hoffmanni - The First Discovery of a Mosasaur? This page was last modified on 23 October 2018, at 23:33.